Alfred Weisberg-Roberts, a.k.a. Daedelus, looks like a man from another time. He adheres to a style he calls "Victorian dandyism," and sometimes he wears clothes that make him look like an 19th-century British gentleman. He grows his sideburns thick and long to accentuate his appearance. He calls himself a romantic. The album art for the two 2006 recordings by Daedelus (whose name is taken from a legendary artificer in Greek mythology) are equally ornate. The cover of Denies the Day's Demise, his album for Los Angeles imprint Mush Records, features a still from Little Nemo in Slumberland, Winsor McCay's beloved 20th-century comic strip about childhood nocturnal fantasies. The Throw a Fit EP, released on L.A. label Alpha Pup Records, shows an illustration of a cat in a Russian military outfit. It holds a piece of origami; the paper art depicts two devils clashing with swords. The drawing, penned by Kozyndan, evokes the same childlike wonder as Little Nemo. More than just some charming images, the album covers hint at an aesthetic fully revealed in Daedelus' music. He crams the tracks with sounds generated from clarinets, guitars, bass, omnichord, autoharps, and pianos. They bustle along like a Wurlitzer organ, yet coalesce into rich and dreamlike tones that tug at memories and fantasies. "If I can make something that moves somebody and moves me, I'm all the better for it," Daedelus says during a conversation from his home in Venice, California. "If it brings a smile or a tear, that's what I want to do. "The stuff that made an impression on me as a youngster, when I first started listening to records, was the classic soundtracks of the '60s and '70s, [and composers like] Bernard Hermann, John Barry, and Michel Legrand. That's emotionally charged music because it's obviously underscoring emotionally charged moments in great films, be it terror, or love, or sadness and melancholy." Those soundtracks, Daedelus adds, "can serve a double purpose of both evoking the idea of a movie and living a life of its own." Daedelus' love of Hollywood soundtracks makes up part of his identity as an L.A. artist. Other sonic traits  a bright and sunny quality, the psychedelic mesh of sounds encased within  are hallmarks of L.A. hip-hop, a style that informs Daedelus' music as much as twee-pop and IDM electronics. Like many members of the L.A. music scene, Daedelus isn't well known outside of underground circles. Some of his friends, like Madlib, Cut Chemist, and Jimmy Tamborello (producer of Dntel and the Postal Service), are lionized by critics and discerning fans; others like himself, Georgia Anne Muldrow, and Carlos Niño (who is part of groups like Ammoncontact and Hu Vibrational) don't get the respect and attention some feel they deserve. But despite his lack of commercial acclaim, Daedelus is one of the most intriguing and unique electronic artists working today. Born and raised in Santa Monica, the 28-year-old musician studied double-bass and clarinet at a young age. "I started in classical music," he says. As a college student, he tried to play jazz bass, but abandoned it for wider experimentation as a rock and electronic musician in various bands. In 2001, he released his first album, the drum 'n' bass/breakcore effort Her's Is. "After I gave up on being a jazz bass player, I really started to encounter what L.A. was about," he says. The city's different music scenes (club and dance music, psychedelic and indie-rock, and avant-garde hip-hop), he noted, function alongside each other. Their easy interaction with one another gave Daedelus the freedom to create music without boundaries or expectations. L.A.'s hip-hop community was the first to notice Daedelus' work. In 2002, he released the light and gossamer Invention, which featured vocals from rappers Sach and Busdriver. "Invention was not a widely received record. But it was sampled by Madlib [on Madvillain's underground hit Madvillainy] and Donnell Jones [on Journey of a Gemini]," he says. Thanks to its accordion samples, Invention achieved collector's item status. Meanwhile, the Busdriver collaboration led to a full-length concept album with another MC, Radioinactive. Daedelus challenged Busdriver and Radioinactive with music that incorporated esoterica like children's and instructional records, shifted tempos, and weird time changes. The MCs responded with bizarrely brilliant speed raps. Their resulting 2003 album together, The Weather, drew critical acclaim for its wide-eyed and fanciful take on hip-hop idioms. "[Things changed for me] because it [was validation] for doing a project that sold more than my previous work," Daedelus says. A modest success in the independent music world, The Weather has moved slightly fewer than 10,000 copies to date. Still, the positive artistic experience led him to practice what he calls "exploding the track," or taking a song into jarring shifts in tone and rhythms. "Every time you change your technique, you get a different texture and a different sound," he says. "I'm addicted to that." Some critics have accused Daedelus of being too precious and eclectic. A second hip-hop record, 2004's Exquisite Corpse, drew uneven reviews from places like URB magazine. Its review said the album "drifts like trade winds, which is good for followers and merely intriguing to the casual listener." 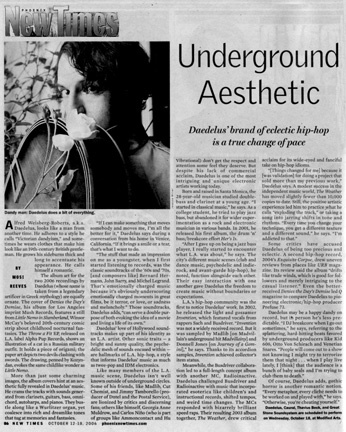 Even the better-received Denies the Day's Demise led Q magazine to compare Daedelus to pioneering electronic/hip-hop producer Prefuse 73. Daedelus may be a happy dandy on record, but in person he's less predictable. "I DJ breakcore when I go out sometimes," he says, referring to the splattering, hard-hitting beats favored by underground producers like Kid 606, Otto Von Schirach and Venetian Snares. "People will come out to a show not knowing I might try to terrorize them that night . . . when I play live lately, I [think] that the audience is a bunch of baby seals and I'm trying to club them to death." Of course, Daedelus adds, gothic horror is another romantic notion. "Every metaphor, every cliché needs to be worked on and played with," he says. "Otherwise, you're cheating yourself."